Are you looking for an alternative flooring option for your new home or home remodeling project? Have you considered professional concrete coatings? Stained concrete from a licensed Mesa contractor is an elegant, economical and environmentally friendly option for updating your home both inside and out. Concrete flooring will give your home a modern and beautiful look and can be done in kitchen floors, living rooms, bathrooms and concrete patios. It is a low cost flooring option that provides a very stylish and updated look to your Mesa home. Barefoot Surfaces can transform your floors with professional concrete coatings. Not only is concrete flooring an affordable and stylish way of modernizing your home, it is extremely durable and easy to maintain. To clean concrete flooring, simply sweep with a broom or dust mop and then damp mop with a warm water and a mild, neutral cleanser. Another huge benefit of concrete flooring, is that it is hypoallergenic. If you battle with allergies, replacing carpet with stained concrete flooring will greatly reduce the allergens in your home as carpet provides a home for dust mites, toxic mold and other household allergens. Ric Ramirez has over 20 years of experience refinishing floors and is a licensed contractor in Arizona. You can trust that he and his crew of flooring professionals will provide you with high quality workmanship along with fair, honest pricing and stellar customer service. They have the expertise to help you through the entire process from start to finish. They will offer design support to help you choose from a numerous selection of stained and stamped finishes for the perfect flooring for your home’s interior and exterior. Barefoot Surfaces has provided homes throughout the Valley and Mesa with professional concrete floor coatings and is happy to help you with your concrete flooring needs. Still not sure concrete flooring is right for you? Check out our gallery of finished stained and sealed concrete. We are certain we will be able to create the perfect floor finishing for your home. Concrete flooring is incredibly versatile, many people are surprised that it can work for any home decor. You can polish the gray concrete as-is, or add color with a stain. Sealant can create a very glossy or a wet look. If you like a marbled finish, we can create that too. Stamping is a popular option and an alternative to tile or wood. You can even stamp concrete to look like wood-grained planks to mimic wood floors. The design options of concrete flooring are endless! Let us help you achieve your dream floor! 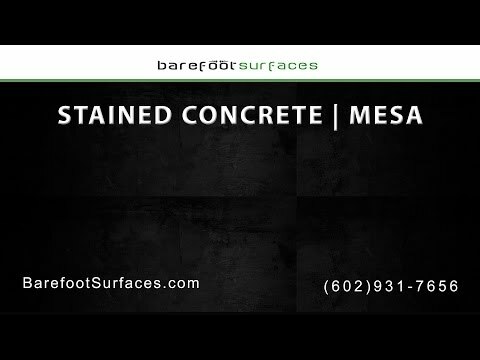 Contact us today to find out more about our Mesa stained concrete services! Upgrade Your Floors today! Barefoot Surfaces is the best Arizona flooring contractor that will create a desirable look in your Mesa home with professional concrete coatings. Your floors will stand the test of time with the durability of concrete. We also offer additional services including decorative concrete overlays, epoxy floor coatings, polyaspartic floor coatings, grind concrete, seal concrete and Slide-Loc garage cabinets. Call Ric today at 602-931-7656 or email at RicR@BareFootSurfaces.com for more information.